PES is increasingly the material of choice to produce cast membranes for particle filtration. Image: iStock. US-based Sumitomo Chemical Advanced Technologies is now offering the engineering thermoplastic polyethersulfone (PES) for the filtration market under the tradename SumikaExcel. PES engineering thermoplastic provides superior properties for fluid handling in applications ranging from dialysis equipment to water-treatment filters. This is because of its high mechanical, chemical, and thermal properties and microporous structure, all of which make the polymer an effective filter medium. Sumitomo Chemical Advanced Technologies now offers four grades (4800P, 5200P, 5400P, and 5900P) of PES for the filtration market. Each grade is supplied as a powder, which is subsequently dissolved in an organic solvent and either spun into hollow fibres or cast as membranes with controllable pore size/diameter and distribution, strength and chemical stability, high porosity and permeability for low fouling and a high level of separation performance. 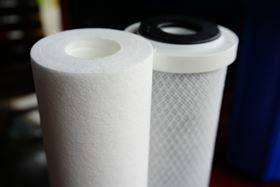 This type of filter media is used in applications as diverse as hollow-fibre dialyser filter packs for low- and high-flux haemodialysis procedures, particle filtration for wastewater treatment, ultrafiltration drinking water decontamination and reverse osmosis for seawater desalination or drinking-water purification. A SupaPore VPBA sterile filter cartridge made it possible to process batches faster whilst maintaining the quality of the final product. Eaton has expanded its range of membrane and depth filter cartridges for wine, beer, mineral water and non-alcoholic beverage applications.